There are small things that can make you very happy; just imagine … you meet a hi-fi distributor to collect a medium range device to review and he proposes to you to review also a Boulder phono preamplifier that costs in Italy 14.000 Euros … isn’t this something to be happy for? Unexpected and more than welcome, of course. Let’s be honest, to be a reviewer can be very exciting and very boring at the same time. There are components on the market that can be defined useless without any fear. You listen to them, then listen once again but there’s nothing that you feel like writing, because there are no special features that makes them different from the rest. Only after long listening sessions you find some of the pros and cons of these components and you have enough elements to write a review. On the other hand there are devices that capture your attention as soon as you switch them on, that keep you stuck to the couch and make you wanna listen to all your best records. Your music thirst cannot be quenched and everytìhing you listen to, seems to be new and interesting. After a while - do not trust those that can evaluate a component after a 15-minute listening - you’ll understand if the differences you are listening to are an upgrade of the overall result or are just new colourings that on the long run will result annoying. Music listening is not an exact science and the differences between one device and the other can be justified by personal preferences. I am sure that if 1000 audiophiles should go to a concert together and if all them could adjust the equalizer we would have at least 950 different set-ups. I first heard about Boulder in 2002 at the CES in the occasion of the launch of the phono preamplifier 2008. We spoke shortly about Boulder when we reviewed the 810 preamplifier. We love to remind everyone that many of the components of the 2000 Series, that were launched about 15 years ago, are still on the market and very requested. This is a clear sign that the project of these devices is of a very high standard and this is the reason for their costs and for the fact that it’s not so easy to find used Boulder to buy. Boulder was founded in the early 80’s by Jeff Nelson and it first dealt only with professional amplifications. Soon after Boulder began to deal with “home” devices and the customers welcomed this news with joy. 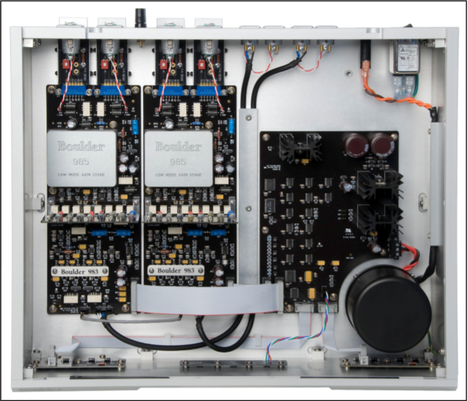 A peculiarity of the Boulder electronics is the use of proprietary gain stages in the Series 2000 and 1000. 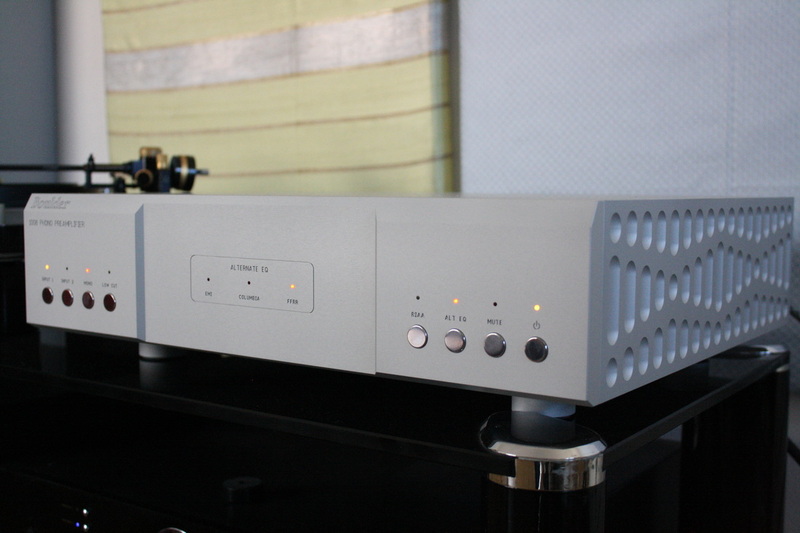 The phono stage model 1008 was born after the big success of public and critic of the model 2008. The purpose was to put on the market a cheaper model that had good performances so that no one could regret the other models. This model contains the famous Boulder modules (the 955, specifically developed for this model) that are assembled in an aerospace metal shell. The robust chassis is manufactured by Boulder that owns the CNC machinery to make it. 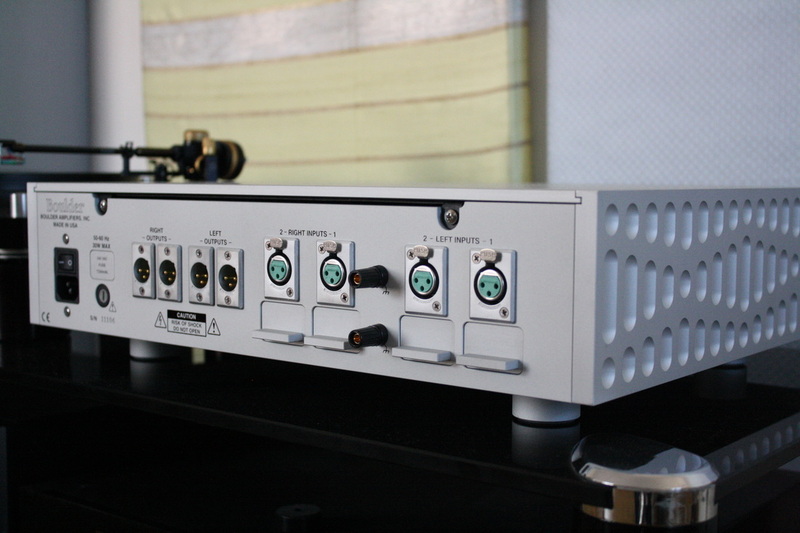 The front panel has many functions and this is quite unusual for a phono pre amp. From left to right we find the mirror-finished chrome selectors for the two inputs that are exclusively balanced, that is a characteristics of Boulder devices. There are no other links available and if you must use the RCA plugs you can use the adaptors that Boulder supplies. You can use two different tonearms, with two different cartridges because you can adjust separately the load of the two inputs. 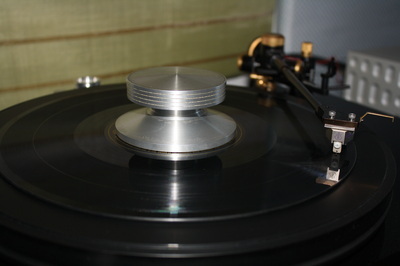 Then there is the the mono switch, that is great to listen to records that are recorded with this technique. It has also the subsonic filter that activates a low-pass filter at 18 dB/octave and that dumps of 3dB the 10 Hz. In the center there is the traditional hollow that characterises the Boulder amplifications, we find the 3 LEDs for the equalizer that differs from RIAA: EMI, Columbia, FFRR. On the right we find the buttons to switch back to RIAA again and to set the alternatives, the mute and and the switch on button. On the rear you can find the IEC port for AC and on top of it the general switch, the fuse, two stereo balanced outputs, two inputs and the ground plugs. 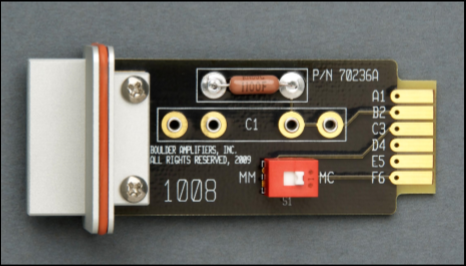 Under the inputs there are 4 removable boards that allow to choose the gain between MM and MC and, through welding of a resistor, to vary the input impedance and capacity. The value of the installed resistance is 100Ohm, while the additional gain of the MC stage is 26 dBs. The MM input capacity is 50 pF and the gain is 44 dB. The gain of the MC stage is 70 dBs and can amplify with ease also low output cartridges without a step-up, if you prefer active amplification. Moreover, this Boulder is particularly quiet. The pictures of the boards that you can see here show the extreme complexity of the circuits that are beyond reach of many craftsmen in the audio sector. The device was new, so I thought that it was better to burn it in leaving it switched on uninterruptedly for a few days. Since I have a balanced phono cable I did not use Boulder supplied adaptors. Moreover my Lyra Kleos supports perfectly a 100 Ohm load so I had not to modify the input boards. AC 1, Black Noise Pearl and others DIY, mains distributor: Lector Edison 230/8, mains filter: Black Noise 2500. In fact, from my JBLs I hear sounds that I have never heard before, string sounds that had remained hidden for many years - this is a 1976 record - sounds that develops in a big space, a space much bigger than my room. I am as in a mystic crisis and I do something I never do when I am reviewing something: I choose another record of the same artist. I select “La Pulce d’Acqua”. I was born with the vinyl, the 45 RPM first that one had to insert in the portable record player and then with the 33 RPM that one had to put delicately on the Garrard Zero 100 SB. Many things have changed since then and I have progressed a lot but that I had so much to discover still, was unpredictable. I listen to “It Will Always Be” by willie Nelson (Lost Highway) a record I love and that I sometimes mention. The voice of the Texan singer is richer than usual. It seems an instrument, tuned at best with the band. It’s a strange sensation, something I cannot explain with words. The low keys go lower than usual but are very solid, precise and strong as if in a live performance. It’s almost midnight. Boy! time flies! I have been listening to music for more than 3 hours and I still find out new melodies. Now all my 1500 vinyl records are a big territory to explore, a big challenge. The 45 RPM version of “Way Out west” by Sonny Rollins (Analogue Production) presents a dynamic sax that reaches straight away the listener. The drums sound is very marked and the double bass is as perfect as it could be. In the Miserere by Arvo Part (ECM) the bass seems to gain half an octave in the lower keys. I check dynamics and transient speed with the “Suite Espanola” by Albeniz, performed by the new Philarmonia Orchestra directed by Fruhberg De Burgos (The Super Analogue Disc) and they are excellent. The higher sounds are sweet, and the hiss of the stylus in the grooves is lower than ever, as are some recording defects or dust noises on the vinyl record. But, despite this, air among the instruments and the soundstage are really amazing. 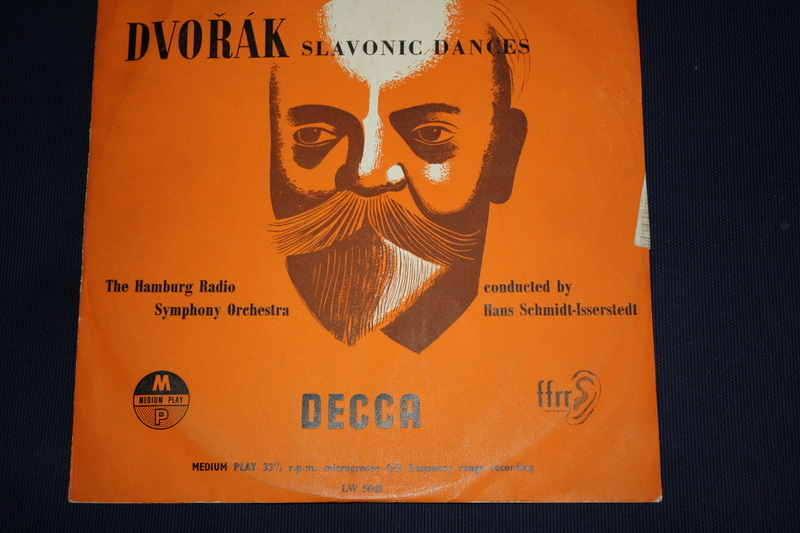 While we were introducing the 1008 we spoke about the possible equalizations and of course we tried them with an old EMI record: “Béla Bartòk, Konzert fur Violine und Orchester Nr.1” with Antal Dorati directing Yehudi Menhuin and the London New Philarmonia Orchestra. The violin, that with the RIAA curve is more similar to a viola playing in a box, suddenly floats in the air, the orchestra becomes bigger and the sound that seemed “old” and badly recorded acquires a great sound. I have tried to find out if Decca, in the FFSS (Full Frequency Stereophonic Sound) already had the RIAA equalization or used still the FFRR. The comparison between two different vinyls demonstrates that the RIAA curve is correct. 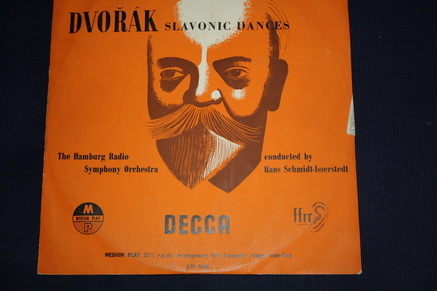 To test the FFRR I choose a strange “Medium Play” Decca FFRR with the Sacred dance by Dvořák, thanks to the right equalization and the mono switch this record, otherwise very hard to listen and badly recorded, becomes very enjoyable. On the Boulder manual there are four interesting diagrams that compare the different equalizations. There’s no use in listing more records, you have probably already guessed that this Boulder 1008 is the best phono stage I have tested so far. Its quality reminds me the Lyra Connoisseur that is no longer being produced and that was on the same price level. It’s a versatile machine, it’s not easy to adjust if you change the stylus but I agree with Boulder that asserts that a 100 Ohms load is fit for most of the MC needles in commerce if you do not have to use a phono stage as an equalizer. Anyway, Boulder recommends in the user’s manual the value of the resistors to buy to have loads between 50 and 1000 Ohms. The 70 dB gain is sufficient to amplify 99% of the cartridges in commerce, leaving aside those strange Japanese cartridges that need a specialized step up. In this case it’s enough to transform the input boards in MM and everything will be alright. What else can I say? Well, while I was listening to music with the 1008 I was trying to imagine its positioning on my rack and how to connect it at best with my system and cables. I was thinking about dividing the records according to their equalization, about finding all the mono records to listen to them properly, about … But sooner or later the alarm clock rings and you have to wake up; it doesn’t matter how much I wish I had it … it’s something I can’t afford. But if you can afford it, well don’t waste your time! Listen to it, test it as usual but I am sure it will be a mere formality because I cannot find one single reason not to buy it.